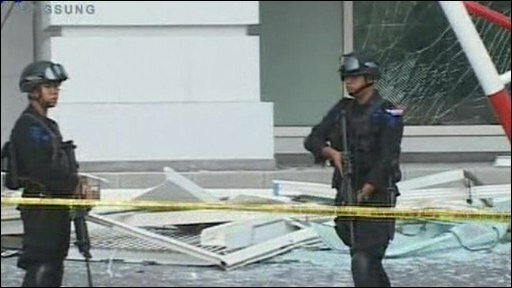 At least nine people including some foreigners have been killed in two bomb blasts at luxury hotels in the Indonesian capital Jakarta, police say. One explosion hit the Ritz-Carlton, ripping off its facade, and the other hit the Marriott Hotel. At least 48 people were injured. Businessman Geoffrey Head was staying in the Ritz Carlton and he described the moment he knew something was wrong.